L’Aquatic Paradis was a waterpark operating for a short time in Sitges near Barcelona however sadly it didn’t last very long due to a number of accidents including a fatality. The park opened in the early 1990s but only operated for two summer seasons before eventually closing due to financial trouble. The park was left abandoned and has fallen into a state of disrepair. 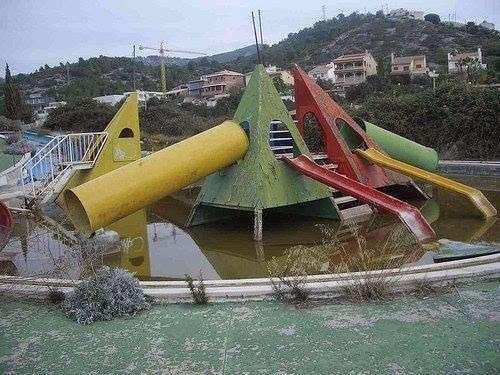 The slides have remained in place and the former L’Aquatic Paradis has become a popular location for Barcelona’s skaters. UPDATE – The following information was sent to us via email by a reader and tells us the story of the abandoned water park. 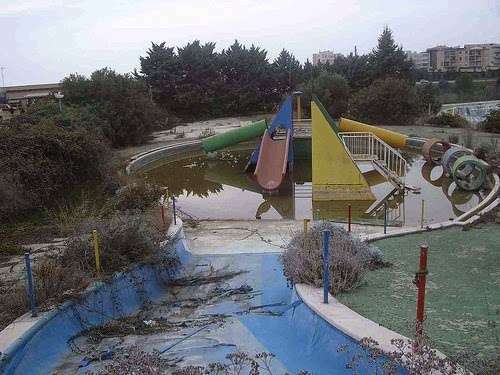 In the early 90’s, Sitges opened a fancy water park but the aquatic paradise was but a fleeting dream. The splashes and laughter of children only lasted two summers. Overwhelmed by debt and lack of sponsors, the Aquatic Park in Sitges ceased to be a paradise and became an urban legend: it is said that a child died in the water park (the most gory rumour is that the child was sucked under by an engine of the wave machine). 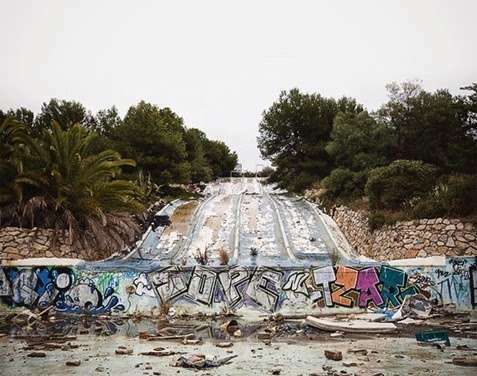 More than 15 years after closing the doors the slides and attractions still remain but the empty pools are now the delight of skaters and graffiti artists. The architecture of the ghost aquatic park has served as background for a sporadic fashion editorials (the models changed into their clothes in the abandoned huts) and a music band have used photos of the derelict Sitges water park as a cover for their album. A couple of years ago, the main entrance of the Aquatic was wide open. Skaters, teens and even a percussion group (their rehearsing did not bother anyone in that area!) could be seen on any one Sunday. It later became more or less sealed off. . While all entries are closed there are always some that slip through a hole. The signs of No Entry and Area of Police Practice does little to deter the artists, which have already painted over the warnings. In a few months the Mossos d’Esquadra may be using the park for training drills of public order. Despite it’s abandonment the park is a privately owned and the owner has reached an agreement with the Catalan police to hand over the place. In 2006, the company Atri S.A. purchased the old park and signed an agreement with the town hall. Their grandiose project for 13.7-acre site was a cultural complex called Parc de les Arts 1. If the plan was adopted, the Parc de les Arts would have a large auditorium, parking, a hotel, many houses, gardens and public squares. But the crisis has postponed this plan and for now, the park still remains one of the most mythical abandoned places of Catalonia.